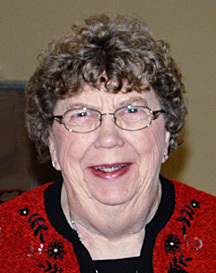 Rose Mae Thorson was born on November 11, 1929 at home in Henning, MN. Her parents were the late Theodore and Lulu (Eggelston) Waskosky. Rose attended school in Henning, MN graduating with the Class of 1948. After graduation, she continued her education by earning some college credits. She was baptized and confirmed at Good Shepherd Lutheran Church in Henning. On June 26, 1948, Rose married Julius Thorson and during their marriage they were blessed with five children. Julius passed away on August 17, 1984. Rose resided in Wapheton, ND, Fergus Falls, and Henning during her lifetime. She worked at Lake Region Hospital as a CNA, Fergus Falls State Hospital as a Human Services Technician for 23 years, and her most rewarding job, as a daycare provider beginning at age 61 and continuing through age 80 for several family members. Teaching Sunday school and being a Den Mother for Girl Scout and Boy Scout Troops, were organizations that Rose devoted a lot of her time. She also was a long-time deer hunter, enjoyed fishing, knitting, quilting, gardening, and baking. Family was important to Rose, and she demonstrated that by caring for grandchildren and at Christmas, she made sure to bake family and friends’ favorite Christmas treats. Rose peacefully entered the glory of heaven on February 12, 2019. She was preceded in death by her parents; husband: Julius; brothers: Roy, Martin, Ted, and Cliff Waskosky; infant brother, Woodroe; sister: Myrtle Leitch; daughter-in-law: Paulette (Kurt) Thorson; sisters-in-law: Helen Waskosky and Eunice Waskosky; and brother-in-law: Arvid Leitch. Left to cherish her memory are children: Douglas (Diane) Thorson, Henning, MN; Cindre (Kelly) Hartshorn, Chandler, AZ; Jodell (Karen) Thorson, Hutchinson, MN; Lorette (Mark) Rudnick, Fergus Falls, MN; Kurt (Marie) Thorson, Henning, MN; nine grandchildren; 31 great-grandchildren (with one on the way); sister: Doris Brekke, Billings, MT; sister-in-law: Dorothy Waskosky, Henning, MN; numerous other relatives and many friends.